A Task List (to-do list) is a list of tasks to be completed, such as steps toward completing a project. A group of tasks comprises a task list in Zoho Projects. Click here to learn more on access privileges for Task Lists. Navigate to your project and click Tasks in the left panel. Click the Add Task drop-down action panel in the upper-right corner, and click Add Task List. Give a name for your Task List. Choose a Related Milestone from the drop-down. When you choose an Internal milestone, the task list will be displayed only to the portal users. When you choose an External milestone, the task list will be displayed to the client users also. Learn more about Milestones. If you don't want to choose from a template and you've changed your mind or so, you can click the Enter TaskList link and get back to the normal mode. Pick a date in the Shift Date field. 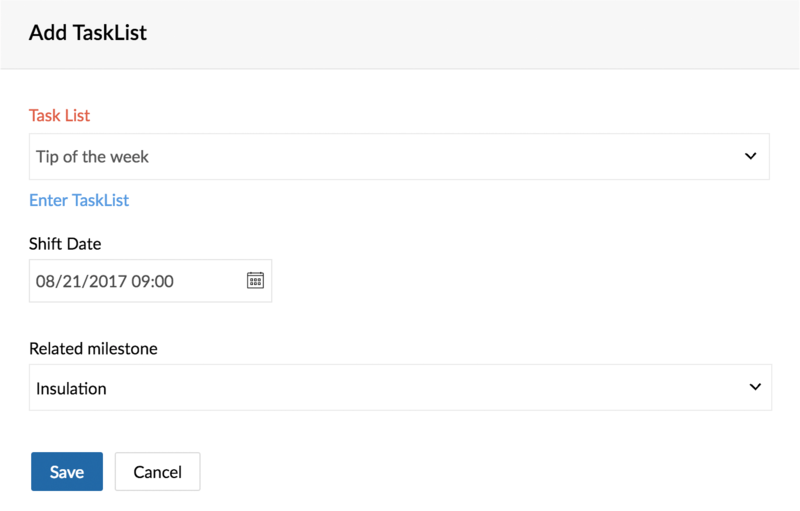 This Shift Date helps you to automate the start date of the tasks when you create a task list template. If you have already created task lists and set dependencies in your project templates, you can use them to create new task lists in your projects. The dependencies between tasks will be carried over to the project. However, if there are dependencies between more than 4 task lists in the project template, you will not be able to create a new task list. Click Choose from project templates. 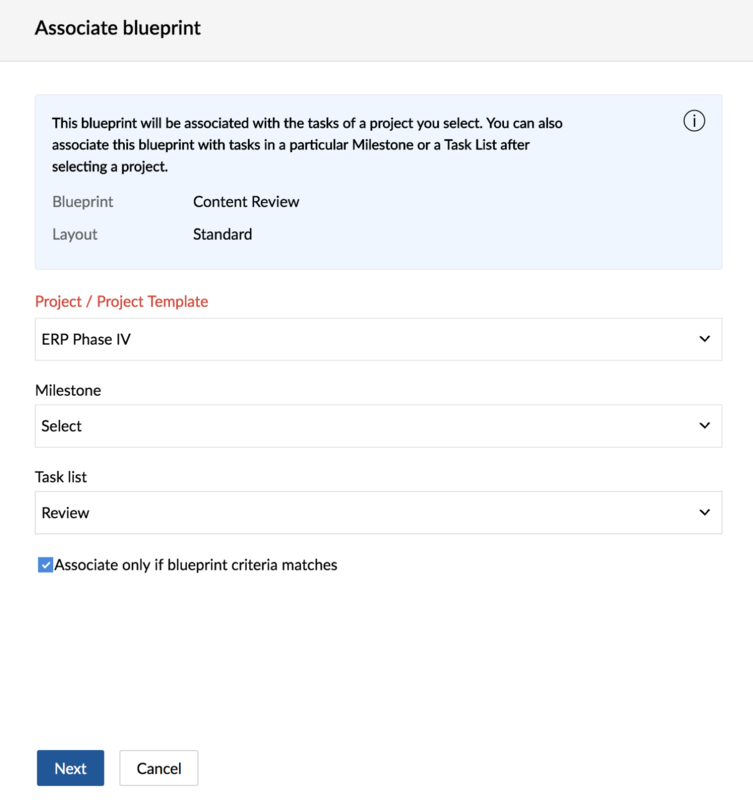 Select the project template and the task list from the drop down. Project templates associated with the current project layout will be displayed in the drop down. Ensure you are in the Classic View and hover over a task list. Click to edit or delete a task list. When you delete, the task list will be deleted with all its associated tasks. Click to move a task list. Click in the upper-right corner and choose Closed Task Lists. You can view the list of all the closed tasks and it's task list for the project. Click in the upper-right corner and choose Reorder Task List. 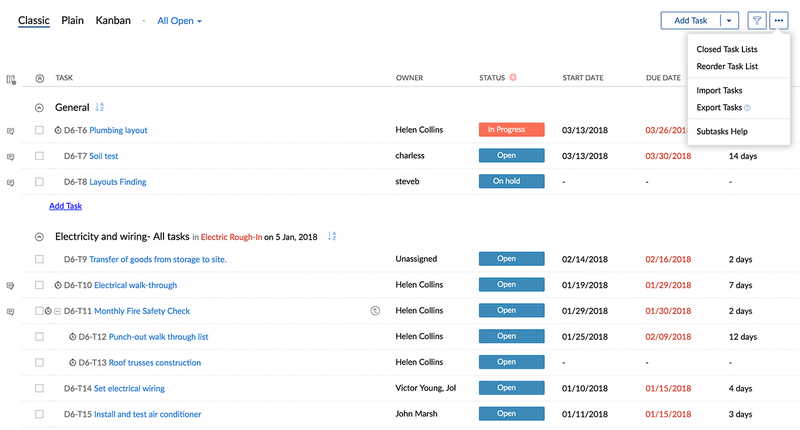 Reordering helps you prioritize and rearrange the task lists based on your project needs at a later point of time. You just need to drag and drop the task lists to reorder and then click Save task list order to save. Click near the task column to expand the task lists and click to collapse task lists. If your task list is not associated to any milestone or if you do not have any milestones, you can directly change the task list flag as External to collaborate with clients. Click and click Edit Task List. Set the Task List Flag to External. The External option is distinctly displayed next to the task list name, signifying that there are no associated milestones. Choose Make As Template to save the task template. 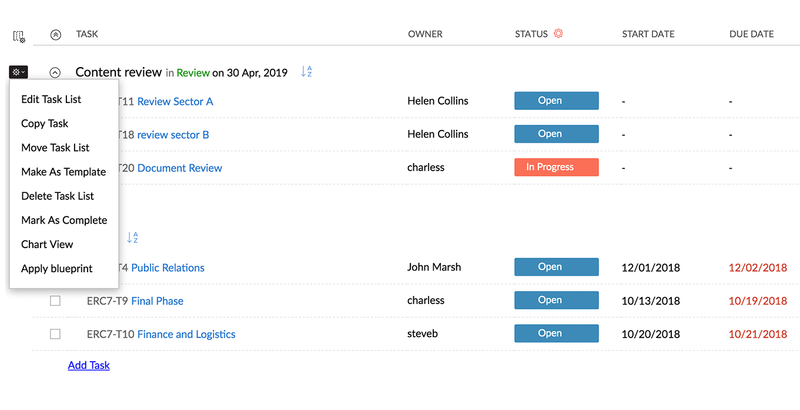 You can complete a task list and move it to closed task list, so that you can track your deliverables. Choose Mark As Complete to close the task list along with it's associated tasks. However, if there are open task(s) in the task list that you wish to complete, a warning message about the open task(s) is displayed. You can view a pie chart for a report on the task list. Choose Chart View to view the task list chart. You can view tasks based on users, open tasks, and closed tasks. You can apply blueprint to the tasks in a task list. Select the blueprint you want to apply. Map the current task status to the status available in the blueprint. The tasks associated with the current status will change as per the blueprint.